As parents, we all want to ensure that our children develop and maintain a consistent oral hygiene routine that will continue into adulthood. At Copperstone Dental, we will include you fully in a dental care program designed to help you take care of your children’s dental and oral health, including how to teach your child to brush and floss in a way that is fun and enjoyable. At Copperstone Dental, we believe that it is important for children to begin their dental experience at an early age. We follow the recommendation made by the Canadian Dental Association for children to have an assessment by a dentist within six months of the eruption of the first tooth or by one year of age. Tooth decay is considered the most common chronic childhood disease and accounts for hundreds of hours of lost school time. By assessing your child every six months to one year, we can identify and treat problematic areas in the mouth with procedures to treat existing cavities and fluoride treatments to strengthen the teeth between cleanings. Early dental visits help us identify problems, such as proper nutritional intake due to an improper bite, developmental concerns related to speech development, habit control treatment for thumb sucking and other oral habits that may impact the health of the teeth and gums. We are also able to diagnose any problems with how the teeth are erupting and plan for future orthodontic intervention. Our team of dental professionals will emphasize the importance of how proper brushing, flossing, and healthy nutrition impacts their oral health in a fun, interactive, and positive manner. By following these guidelines, our goal to help your child grow up with healthy teeth and gums that will last them a lifetime! To continue improvement in the oral health of children, parents must be diligent even before birth. Unbeknownst to most parents and providers, the bacteria responsible for dental cavities can be transferred from parents (primarily mothers) to their young offspring. Newborns are not actually born with the primary bacteria (Streptococcus mutans) necessary to cause dental cavities. 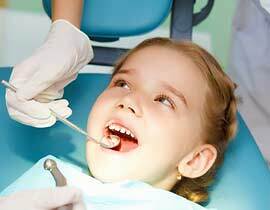 Therefore it is recommended that parents have their dental treatment completed before the birth of their child to minimize the transference of Strep mutans. This can help minimize your child’s risk of developing early childhood cavities. Another important fact to remember is never put your baby to bed with a bottle filled with anything but water. Milk, fruit drinks, apple juice, or sugar water in a bottle overnight can wreak havoc with developing teeth, often resulting in rampant dental cavities. Another way to prevent early dental cavities is to begin brushing as soon as the first teeth erupt into the mouth. This should be done twice daily (once in the morning and once before bedtime) with very little toothpaste. Starting this pattern of home care early on will develop a healthy habit of good oral hygiene that will last a lifetime. By one year of age, your child should have his or her first teeth and the first dental examination should follow soon thereafter. Regular checkups every six months should then be completed in order to maintain good oral health and treat issues while they are relatively small. Dental sealants help prevent the development of dental cavities in newly erupted permanent back teeth (molars and pre-molars). They involve the application of a bonded material to seal off the deep grooves that these teeth possess. They are quick and easy to apply, but very effective in preventing the onset of cavities on these tooth surfaces. At Copperstone Dental we feel that by encouraging proper techniques and dental care in a comfortable and caring environment, children will have an enjoyable time at our office and will be eager to continue future dental visits. Call us at (403) 263-0711 to book your new patient consultation with us today! Disclaimer: Dr. Tonny Tang is a South Calgary General Dentist. He is not a specialist in Cosmetic or Family Dentistry. Cosmetic and Family Dentistry are not specialties recognized by the Alberta Dental Association & College (ADA&C). General dentists can provide cosmetic dental procedures such as porcelain veneers, dental implants, dental braces, and teeth whitening as part of their General Dentistry license. As a SE Calgary Family Dentist, Dr. Tonny Tang provides General Dental procedures for all ages within the family.